Our inaugural project titled Winter Wear was made possible through the amazing platform of crowd-funding. Through one simple idea, a thoughtful video and the span of the internet we were able to share our Tribe of Lambs dream and help 55 children in need. Our founder Bobbi was teaching dance lessons at two children’s orphanages in northern India and became inspired to help out. After 31 days of crowdfunding the initial goal wasn’t reached but the reach was still far. With the funding raised Bobbi was able to not only launch Tribe of Lambs through the relationships with cooperatives and local artisans but also make a thoughtful impact for the kids. The mountain region of Manali/Kullu lies in the foothills of the Himalaya range, which naturally results in very cold winters. The caretakers at these homes (both government and non) often don’t have the resources to purchase yearly essentials such as weather protective wear and new underwear. As well, teenage girls in India often face problems with infection due to the shame surrounding menstrual cycles. Reusable cloth napkins are not cleaned and dried properly and lead to bacteria growth. Tribe of Lambs made a small contribution to help lift some of these burdens temporarily. The temporary solution is a far cry from a resolve, however we hope that the act of doing something inspires others to do the same, while allowing the children and their caretakers to know they are not forgotten. After a successful crowdfunding campaign Bobbi was able to shop with her local friend for the best products possible in terms of warmth and quality. 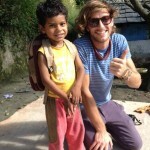 Phil arrived in India and headed straight for the mountains to help in the delivery. Together with Manjeet the Driver, they loaded up the van and spent the full day driving to the 3 separate homes delivering gifts, playing games, dancing and singing. The perks were mailed out to contributors in Canada, USA, England, Spain, Australia and even Oman! 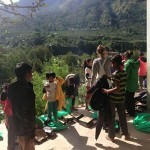 It was a great first to a future of creating lasting impact for at-risk children in developing countries. Check out the Indigogo Campaign.